From top to bottom. CiM Cirrus rods, Vetrofond Silk (original), CiM Marshmallow. Vetrofond Silk 2 is very similar to CiM Marshmallow. I have been wanting to write up the testing notes for Cirrus for a while now, but I didn’t have any beads on hand made with the colour. 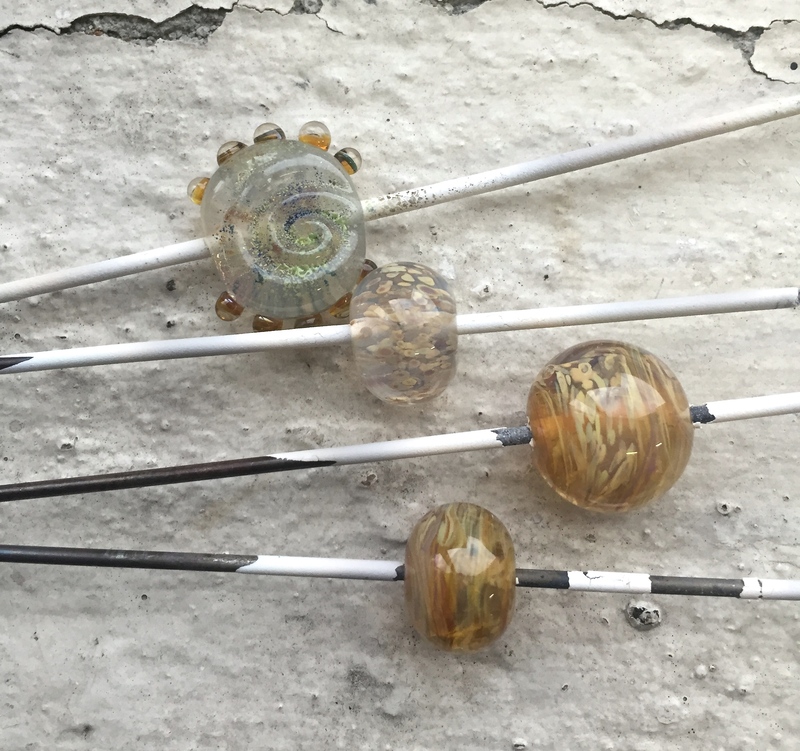 CiM Cirrus was an on release glass in 2006 when Creation is Messy first began crafting COE104 rods for lampworkers. Back then it was very exciting to have a glass like Cirrus; a true moonstone glass. I don’t recall another glass like it at the time, Vetrofond Silk was perhaps the closest. After all these years, I am still in love with Cirrus. Even though it is a glass that is mostly overlooked these days, I hope you will find renewed delight in its simplicity after reading through these testing notes. This is a longer than usual testing blog post as I go into a lot of detail about how Cirrus is used and what it can be used for. 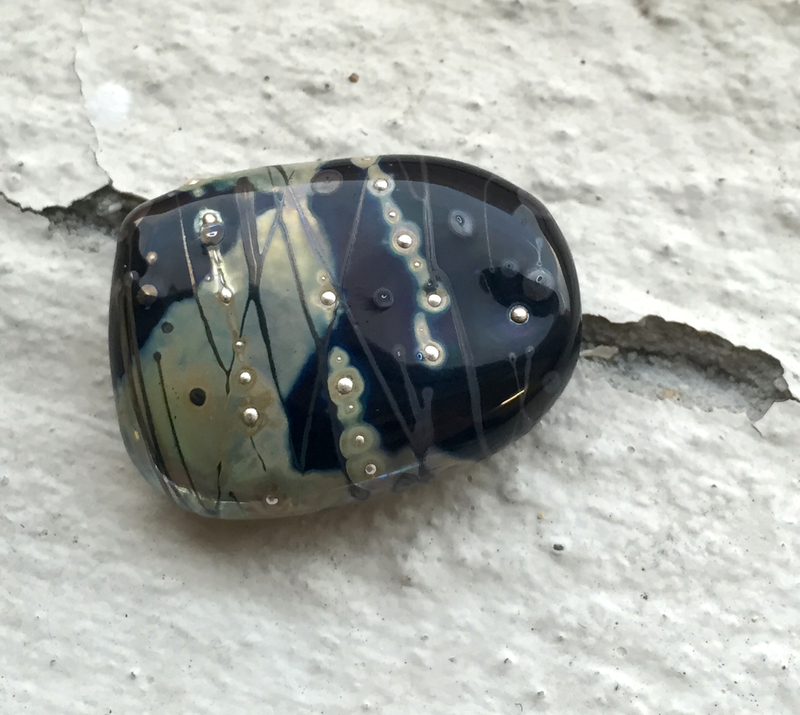 A bead made with a base of CiM Ginger, layered with Reichenbach “Raku” frit, encased with CiM Cirrus. Flowers are CiM Celadon covered with Cirrus. Cim Cirrus block ended with Effetre Turquoise and Effetre Sunny Mango spattered with Reichenbach Raku Frit that has been heavily reduced. There is a very fine blog on Cirrus written for the Frantz Newsletter in 2009. This is a good start but the secrets to Cirrus are beyond this starting point. As this blog suggests; Cirrus is a translucent cloudy glass. Unlike other cloudy glasses that only reflect the present colour back, Cirrus reflects a blue tint (depending on the light it can throw peach tints as well) in addition to its milky whiteness, just like moonstone. This is very useful for making beads as it adds depth to your existing colour palette. I use Cirrus a lot in place of clear glass. Instead of encasing with clear, I will encase with Cirrus for a soft dream like bead. It is particularly beautiful when used in small amounts over dots, as the blue translucence catches the light and adds depth in a new way. I cannot say that Cirrus always lightens opaque colours when used over the top, that is greatly determined by the depth of the encasement, how it’s left to melt in and if you managed to keep the moonstone effect. What I can say is, that a simple three colour palette using Cirrus becomes more, as layering Cirrus can achieve different tones in your opaque glass. Cirrus shows its blue tones most on a black or dark background. The top bead was made in layers, the centre was worked hot and fast and has very little colour. The bottom is one layer worked cold. It is possible to burn Cirrus. In fact, I find it very easy to scum if dropped too low in my flame or heated too quickly. You must definitely work Cirrus cool otherwise it will develop dark striations on the surface of the glass. On my Minor, I found the best working zone to melt Cirrus is the upper part of the middle heat zone. The best zone to keep Cirrus warm whilst decorating is about a half inch up (this is also where you should be applying Cirrus stringer decoration). If you work in those zones Cirrus will keep it’s moonstone effect. It is very important not to overheat Cirrus, do not zap it quickly in very high heat, even if you don’t get the black scum developing you will burn it out to clear. 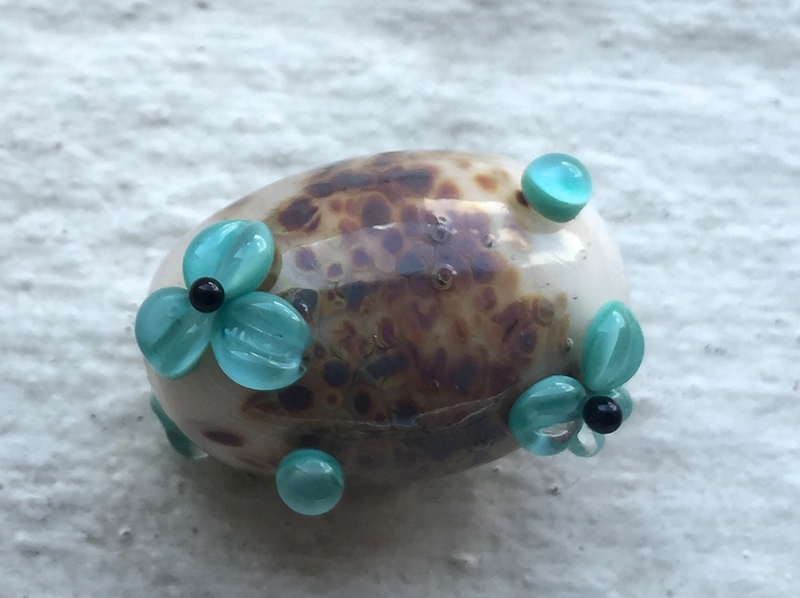 You can resurrect some of it’s moonstone effect by letting it cool right down and heating it gently in a reduction rich blue flame, but it’s not always salvageable and the bead might just look like a slightly blue clear glass. The best way to get a strong moonstone effect is to work cold and build the bead up in layers, basically think of it as “encasing” Cirrus with layers of itself. This photo shows differences in opacity with Cirrus. Layering it and working cold gets best results. 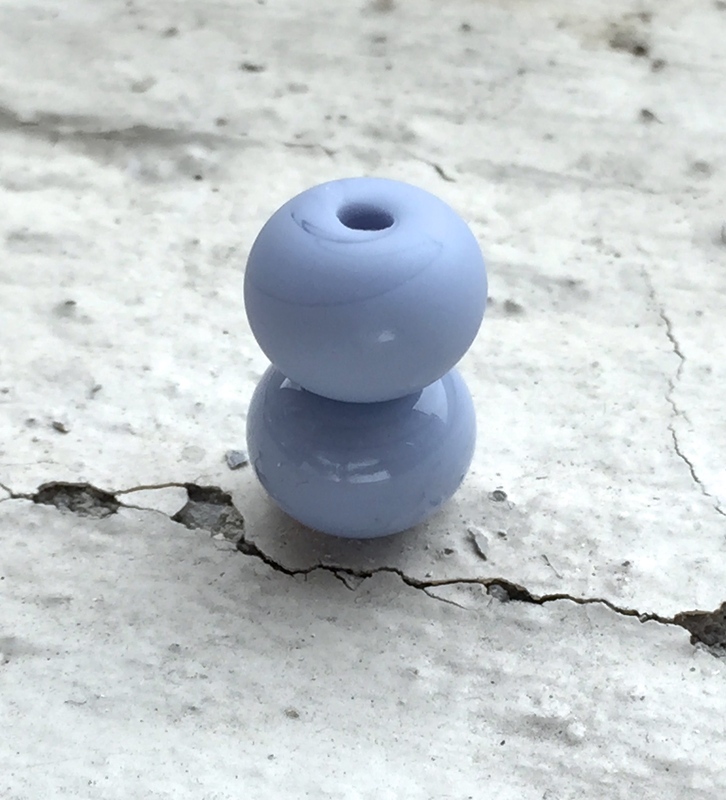 The bottom bead is a base of Effetre Pearl Grey heavily encased in Cirrus. Cirrus responds to being cooled down outside of the flame then reduction striking (long blue flame by turning up your propane) as a means of drawing out more of it’s cloudiness. Although a great deal of that is determined by how you heated the bead in the first place. 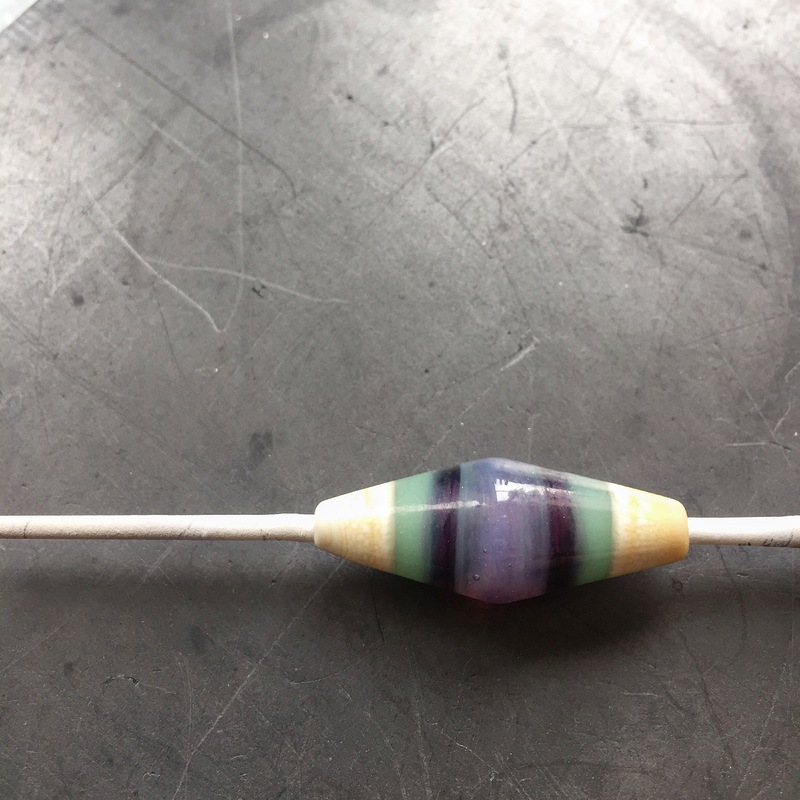 One of my tricks to getting a very moonstone looking bead is to create a small base bead, working it cold and slow to maintain as much of the cloudy blue colour as I can, then I encase the Cirrus base bead with Cirrus and gently melt in. I will do this as many times as I need to get the bead to the size I want, rather than melting a big gather. I’m not particularly scientific but I think what is happening by building up a bead like this; is that the optic quality of Cirrus is increased through reflection as each encased layer is reflected through all the other layers. Cirrus will also look cloudier the longer and slower you work it, so if you’re beavering away on a complex surface design, expect your Cirrus bead to look very hazy and translucent by the time you’re finished. 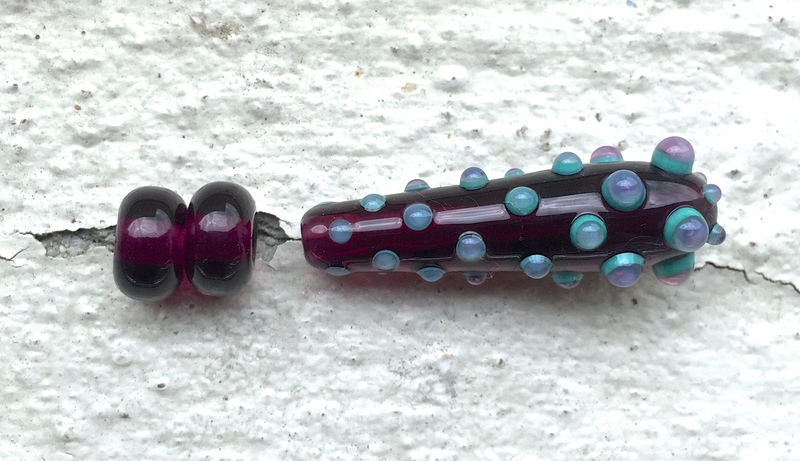 These dots on these beads are made with the blended stringers. Cirrus can almost double your colour palette. This effect is very different to layering Cirrus over opaque dots. The base is Vetrofond Banana Special Odd. The little round bead was made using the 50/50 blend of Sunny Mango and Cirrus. It’s noticeably different from the Sunny Mango on the tube bead. To my mind, the best thing about Cirrus isn’t when it’s used as a base bead. For me, Cirrus is like valuable paint. You can mix it with other opaque colours to radically change those opaques into semi translucent versions of themselves. I hand blend a lot of stringer so that I can get new colours for beads and one of my tricks has been to use Cirrus as a modifier. 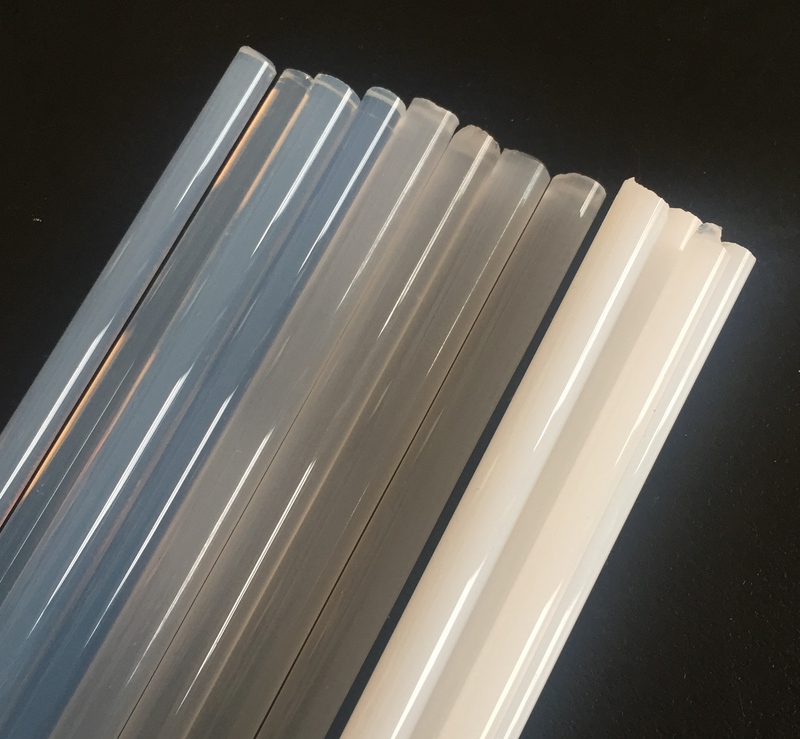 A long time ago Vetrofond produced a colour called Silk, it is very similar to Cirrus but without the moonstone appearance. Sadly, Silk is no longer in production and I used to use it for all my blending. Cirrus replaced Silk for me to an extent. My particular favourite is to blend 60% Cirrus with 40% Effetre Dark Turquoise in the flame and pull a thick stringer. I adore how Dark Turquoise takes on a new dimension, it’s not quite opaque anymore nor is it a transparent. For the purpose of this blog I decided to blend Cirrus with Effetre Sunny Mango and the result was the same as for Dark Turquoise, a new colour that wasn’t quite opaque and not quite transparent. Once you get started blending Cirrus with opaque colours you can’t stop (at least I can’t). However a word of advice on the blending, err on the side of caution when mixing Cirrus with any orange and yellow glass. 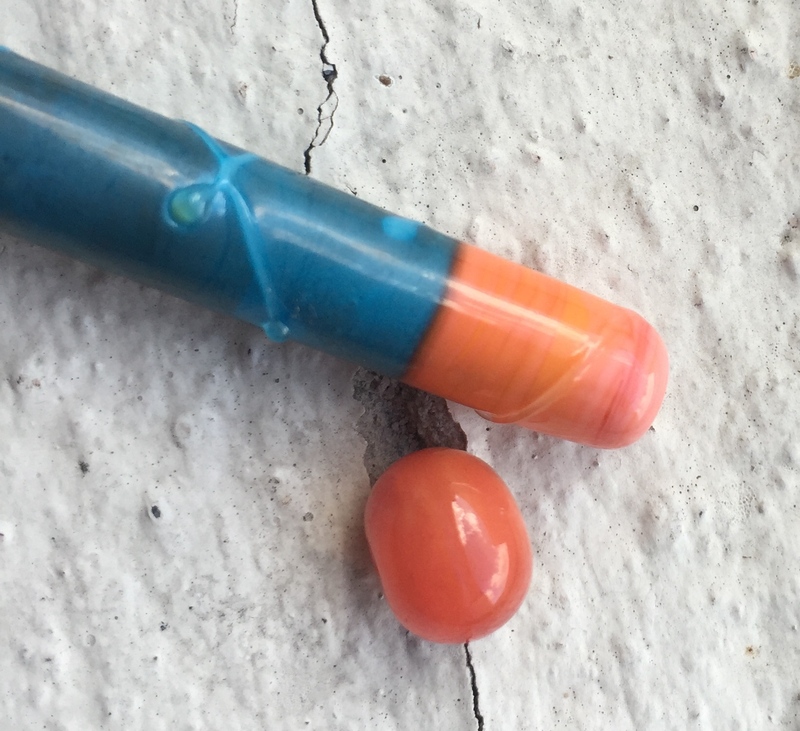 I found with the Sunny Mango blend that the stringer wanted to bubble up and scum in the flame, although the bubbles aren’t visible in the finished bead. Also, a 50/50 mix is a good starting point, but if you want more ethereal “smokey” colours add more Cirrus and pull your stringer out with the blend just mixed in. Streaky stringer leaves a wonderful “coloured smoke” appearance. If you check out my Instagram feed you will see video of the stringer pulled with Effetre Dark Tuquoise and Cirrus and Effetre Sunny Mango and Cirrus. CiM Cirrus over Effetre White is a disaster waiting to happen. It usually doesn’t happen right away, incompatibility will appear after a few days (even after annealing). 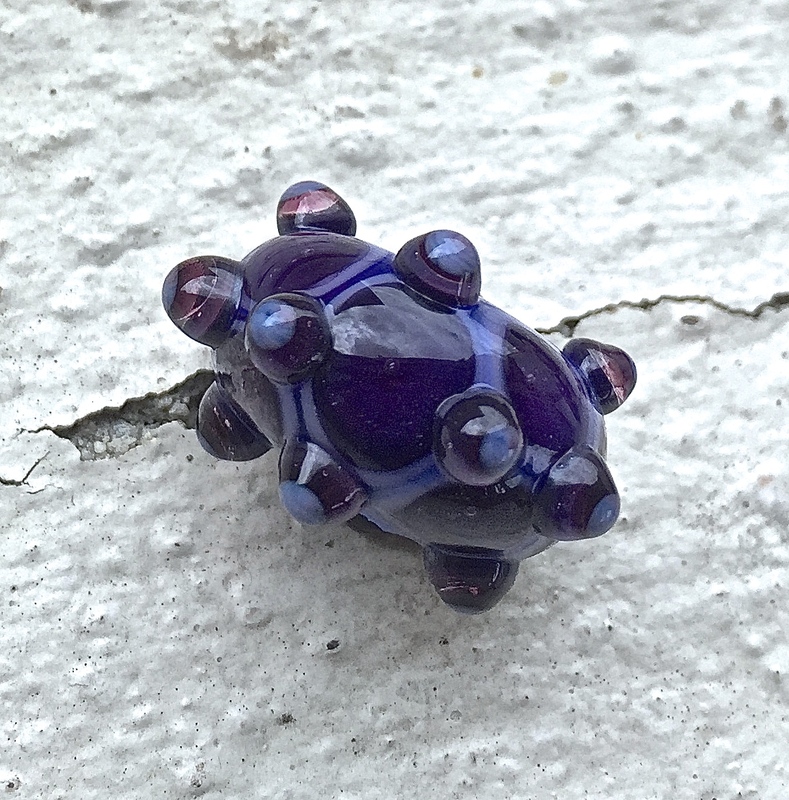 I wanted to show you how spectacular the reaction is, so worked this bead until it cracked. This cracked in the flame and no, it’s not the Raku frit creating the incompatibility, it is definitely Effetre Opaque White that CiM Cirrus hates. This sort of translucent “milk” glass has always had compatibility issues no matter who manufactures it. Vetrofond Silk had a lot of incompatibility issues, which is why they created “Silk 2” and now neither glass is for sale. Cirrus is the same, I’m still discovering what it can and won’t work with, every time new glass is released. The biggest issue occurs with Effetre Opaque White and CiM Celadon. Absolutely under no circumstances should you use Effetre Opaque White with Cirrus. Just don’t. Not even as a layer underneath another layer of glass. My habit is to use Effetre White as a core for really big beads and I get incompatibility cracks all too often when I pick up a rod of Cirrus to encase with instead of clear. It will incompatibility crack either in the flame or days later depending on how little or much you’ve used. I’ve had beads go into the kiln fine and come out with incompatibility cracks. I’ve spent a few hours making beads today so that you can see how they crack when used with Effetre Opaque White, check the photos. Another incompatibility test is Cirrus and CiM Celadon, but here’s the thing; this combination doesn’t always crack. There seems to be no problem when Celadon dots are encased or when Celadon is thinly encased in Cirrus. The problems arise with deep encasement. You can clearly see a colour shift in Celadon encased in Cirrus. 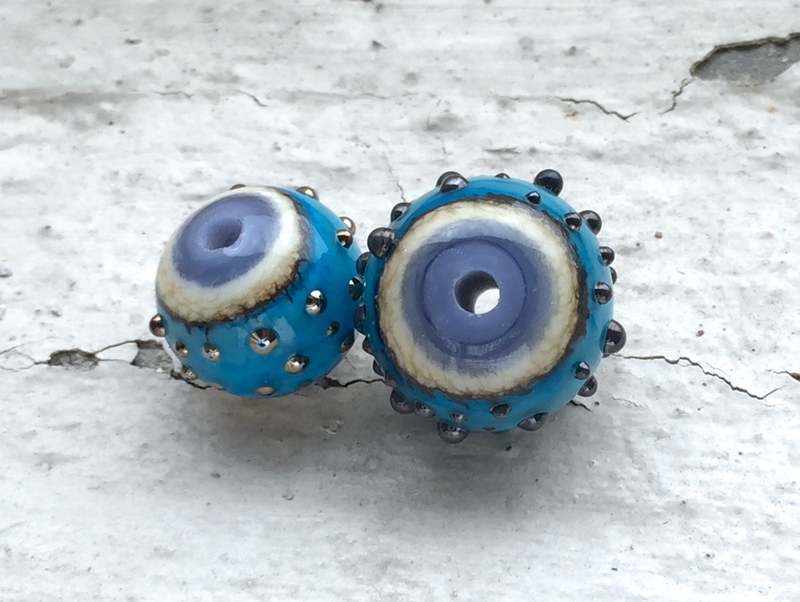 If the colour washes out to pale blue green, its too deeply encased and your bead will crack. 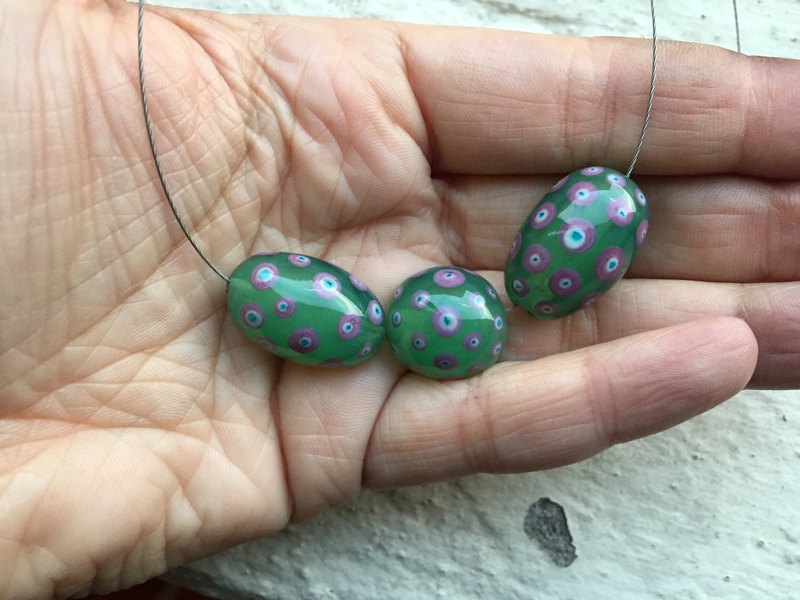 If the colour stays a more true sea green, it’s thinly encased and your bead will not crack. Unless you can linear encase evenly, do not encase Celadon in Cirrus, there will be trauma and I think it is Celadon that is the culprit. 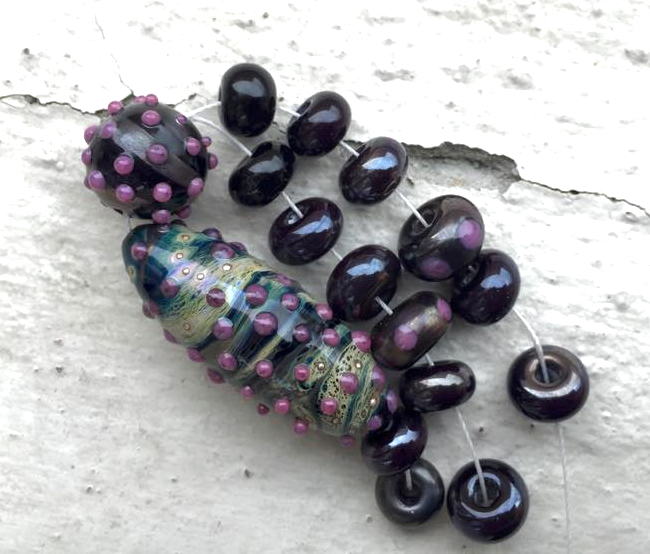 The long bead is Effetre Dark Violet with CiM Cirrus trailed over the top for the water colour effect. The bead above is Celadon with Cirrus watercolour trails. Cirrus sometimes devitrifies over Celadon when it is overheated or reduced too harshly. Perhaps the last secret with Cirrus is the best. On dark opaque glass (particularly Effetre purples) trails of Cirrus melted in will spread out and look just like water has been spattered over watercolour paint. To my mind it is such a cool effect, that this alone makes Cirrus a useful colour to have on hand. (See the photo above). I use this trick a lot in my beads and you can be guaranteed that somewhere in the background of an sgraffito design is a generous smattering of Cirrus. I have a few favourites that I like to do this with particularly and in a later blog post I will create a “cheat sheet” of watercolour effect for Cirrus. Like Peacock Green, Cirrus does not etch very well and you can use it as a “mask” to bring out certain effects. This is particularly good if you have blended it with another colour and created stringer or dot decoration but want the base bead etched. Because Cirrus spreads out so readily on opaque glass I often use it to push dots into designs. I prefer it over other transparent glasses because its not as stiff. Cirrus looks surprisingly good when stamped or pressed into faceted beads. Cirrus works well with Thompson Enamels, although I find they tend to sit on top and not melt in but that could be because I work Cirrus beads fairly cool. Cirrus is a spreading glass, this is evident by the watercolour effect but it’s also really handy to know for creating dot bead effects. The usefulness of a soft “almost transparent” glass is that you can use it as an intermediate layer to push dots into geometric patterns easily. It’s also helpful in maintaining lines between your dots. Sure you can use Effetre clear to do that, but why would you not mix it up a bit with a cloudy transparent glass? The lower two “browny” beads are made by melting a gather and rolling it in frit then forming the bead. This demonstrates how Cirrus blends easily with frit. Excuse the busted bead release, I was half cleaning these beads when I thought I should grab a photo of them. Cirrus is good for pushing dots around in layered bead effects. It is particularly useful as most transparent glass is very stiff and does not want to move across a base bead enough to merge into geometric dot patterns. Cirrus creates subtle colour shifting and colour changes when layered over colours. 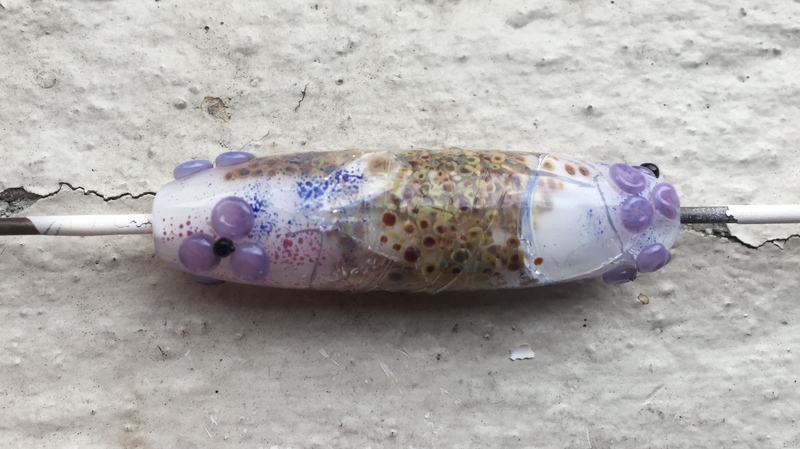 Its helpful in creating depth in dots because of it’s nature to reflect a blue tint, so it looks excellent on purple, blue and green glass. 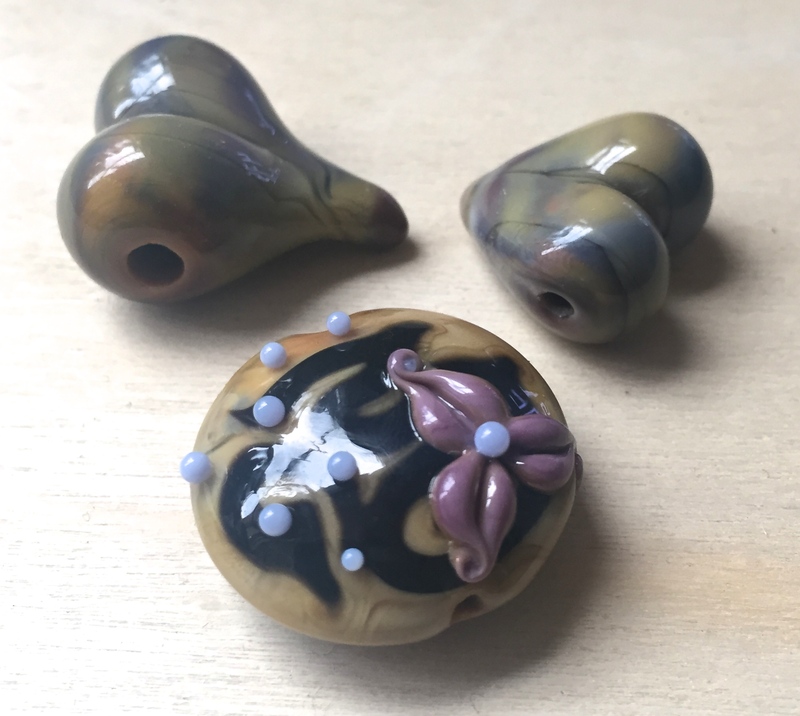 The bubble dot bead in the picture is a base of Effetre Lavender, dots of CiM Celadon, dots of Reichenbach Raspberry (96), Dots of CiM Cirrus over the top. The dots melted and moved into a geometric position with the final layer of Cirrus. Some of my Cirrus dot placement is not perfect and it has overlapped the Reichenbach Raspberry and Celadon causing a bit of a colour merge between those two colours and a colour shift; Celadon appears lighter. 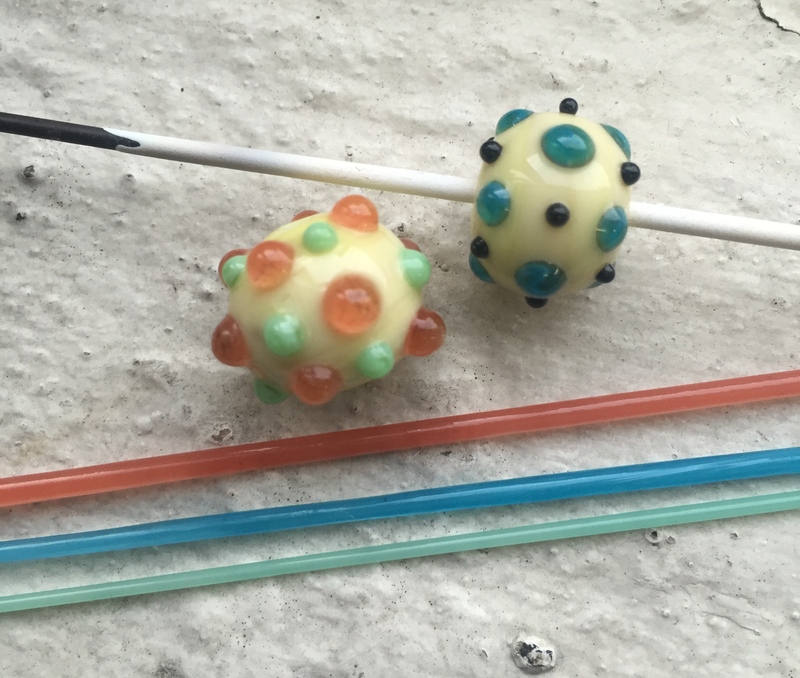 Depending on what you’re trying to achieve with your beads, you might welcome that Cirrus is a good blender or colour shifter and use it to great effect in your own glass beads. Edit: I’ve been asked to explain the beads in the cover photo that I don’t mention in this blog. The middle bead with the over twisted swirls is a blend of CiM Cirrus and Effetre Pearl Grey pulled into stringer than used as decoration. The big bead with the “belly” is encased in Cirrus, but I overheated it and burned out the lovely moonstone colour. 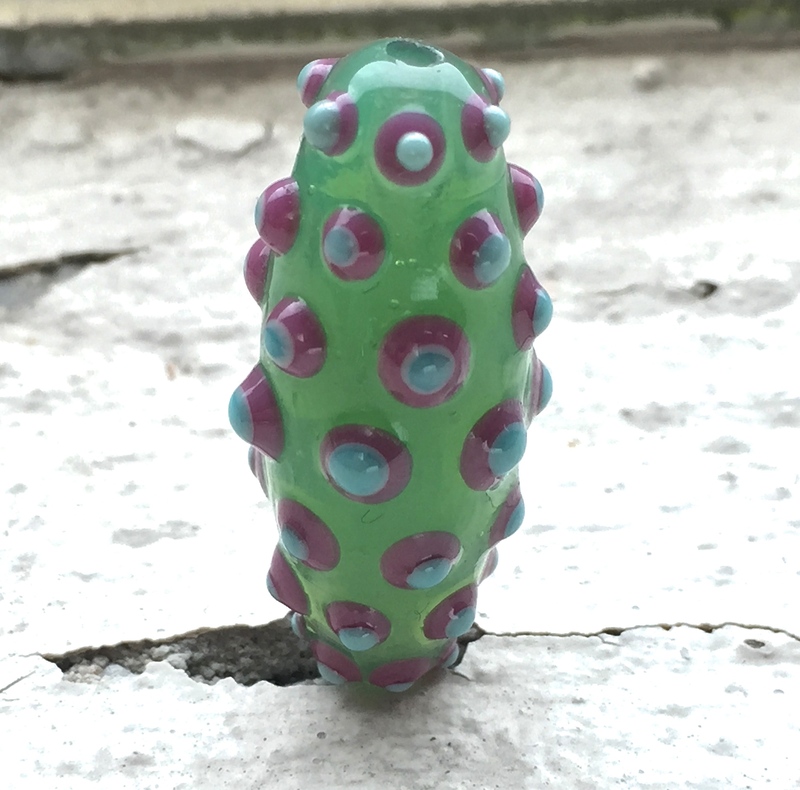 The unfortunate thing with this bead is that I had a central core of Effetre White and it incompatibility cracked in the kiln. I repaired it back in the flame, but the same thing happened; incompatibility cracks. This is how I know that Effetre White and CiM Cirrus do not mix even when layered under another colour. 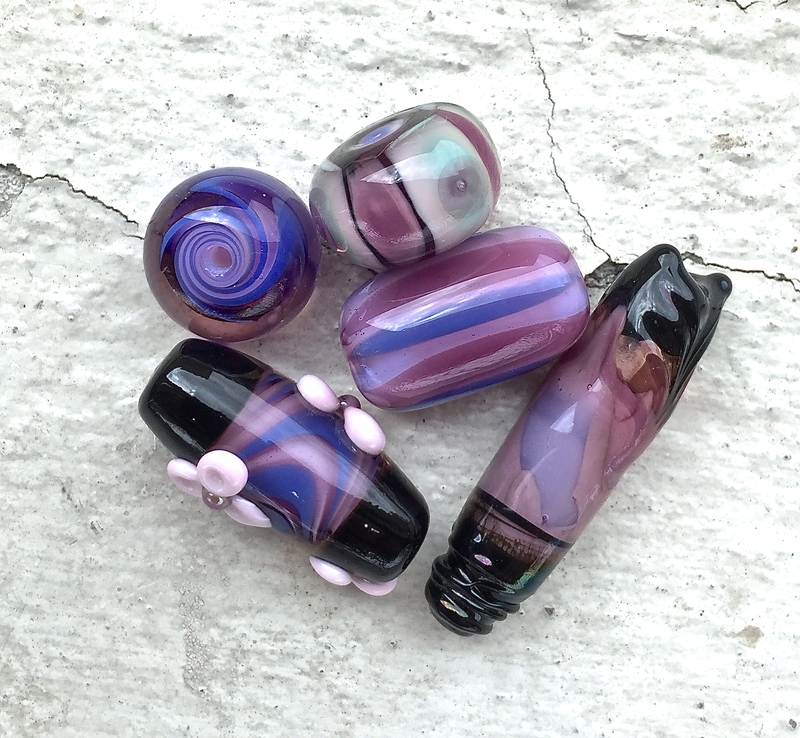 So there you have it, all the reasons why I think Cirrus is a remarkable addition to the lampworking colour palette. CiM Glacier was originally called Blue Slate, but it was not commercially available under this name. CiM did release a colour called Blue Steel and it is different to Glacier. My batch of CiM Glacier is so old, that some of the rods have the original tag name for it; “Blue Slate”. Although CiM went on to produce a different glass with a similar name (Blue Steel), which is an altogether different colour. Glacier is a solid cool pastel blue, that is soft and buttery to melt in the flame. I’ve never had it ping or crack even without pre-warming the end of a rod. Its a very forgiving glass as it is hard to burn and holds heat deep in its core, which makes it a good base for finicky designs. CiM Glacier etched (top) and not etched (bottom). See what I mean, it looks wonderful etched. I’ll confess that I’ve only recently fallen in love with Glacier, I thought it was such a “blah” colour for a long time. I didn’t think how this particular shade of non reactive, non streaky, just very plain blue was anything special. I was so very wrong. I’ve gone from hardly using Glacier to spending the last six months constantly using it. Glacier completely loses any of it’s streakiness (not that my batches have much streakiness to them at all) when heated over a long period of time. It’s a very solid soft pastel blue colour that etches to perfection. (Yeah, I am in love with this glass). Glacier looks better etched. It is nice when it’s glossy, but the soft blue it becomes when etched is very hard to resist. CiM Glacier as the base, layered with Effetre Dark Ivory, then a layer of Effetre Turquoise, then a layer of CiM Cirrus and random dots of unknown Reichenbach glass, reduced. The beauty of CiM Glacier is in how well it mixes with Effetre pastels. When Glacier is superheated and swirled with Effetre Dark Ivory it still maintained it’s density and didn’t spread out as I expected a soft glass would. I had to really twist and twirl the two colours together to get some reaction. When superheating where Glacier and Ivory meet there is some frazzling, caramelising and mixing of the two colours. Although, if you do not superheat, you can keep a very sharp line between Glacier and any other opaque glass. I’ve personally fallen in love with the blend of Ivory, Glacier, Avocado and Copper Green. CiM Glacier base with Val Cox Frit “Straw Fire” Some of the COE96 Frit has spread out and some colours have developed a water colour effect. When you pair Glacier with Effetre Violet Pastel a slight watercolour reaction occurs. Glacier will seep out over Violet Pastel in a way that looks remarkably like water paints. Moreover, Glacier in thin trails or stringer takes on a more lavender hue. It took me far too long to work this out, because I had pulled a bunch of Glacier stringer once and left them sitting in a jar with the purple stringers because I’d completely stopped paying attention that day. 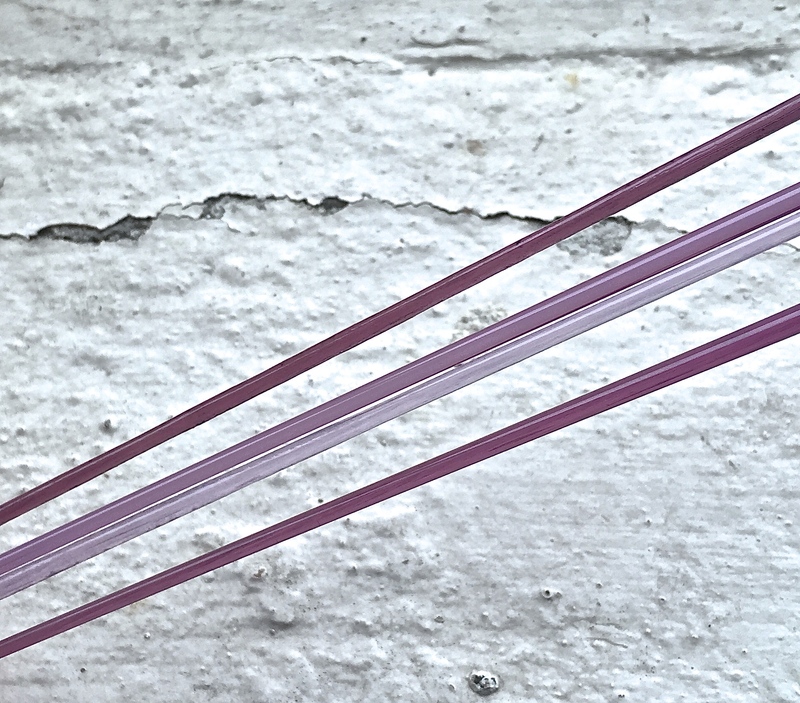 Much later I grabbed one of these “lavender” stringers and used them with Effetre Violet Pastel then when I was asked to repeat a bead, I couldn’t figure out what glass I’d used. Effetre Machine Pulled Avocado, Effetre Ivory, Cim Glacier with dots of Effetre Copper Green on top. Prolonged gentle heating changes Glacier to this rich, almost royal blue. So, I went looking for a “lavender” glass that was giving me those lovely watercolour reactions and didn’t find one. If you look at the beads in the last photo, this is the reaction I’m talking about. A very thin layering of Glacier will look like pale lavender glass. Be mindful of this if you want blue trails or a slender tube bead to look more blue, you’re better off using a blue like CiM Zachary or CiM French Blue that doesn’t colour change when used in small quantities. Only recently did I put Glacier and Violet Pastel together again and there was the magic. I’ve gotten the same (but less intense) effect of layering Glacier stringer over other Effetre pastel purples and on CiM Gelly’s Sty as well. Etch the watercolour reaction sometime, it’s worth doing. Etching pulls out some striations. 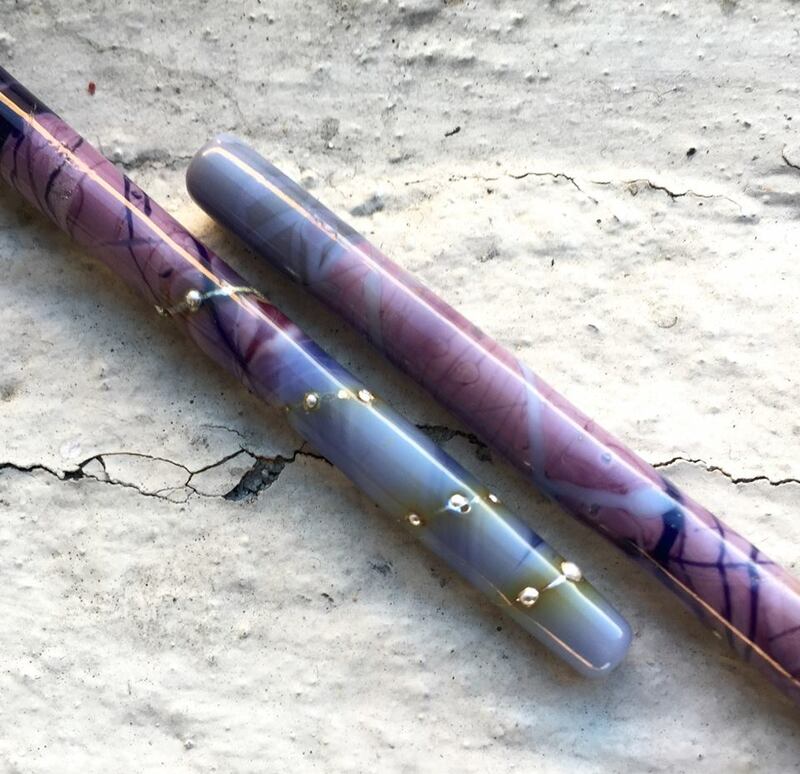 CiM Glacier blended and trailed with Effetre Pastel Violet, CiM Thai Orchid and Fine Silver wire, which leaves a yellow reaction halo around Glacier. Note on the upper portion of the top bead the reaction of Glacier trails on top of Glacier which has darkened from prolonged heating. Also notice the trail lines that have blurred into a watercolour effect. However, CiM Cirrus and CiM Glacier do not play well together when Cirrus is used as a stringer design over Glacier, it will always devitrify. I haven’t noticed any other colours doing that over Glacier, it could be a quirk with Cirrus. It bears more investigation. 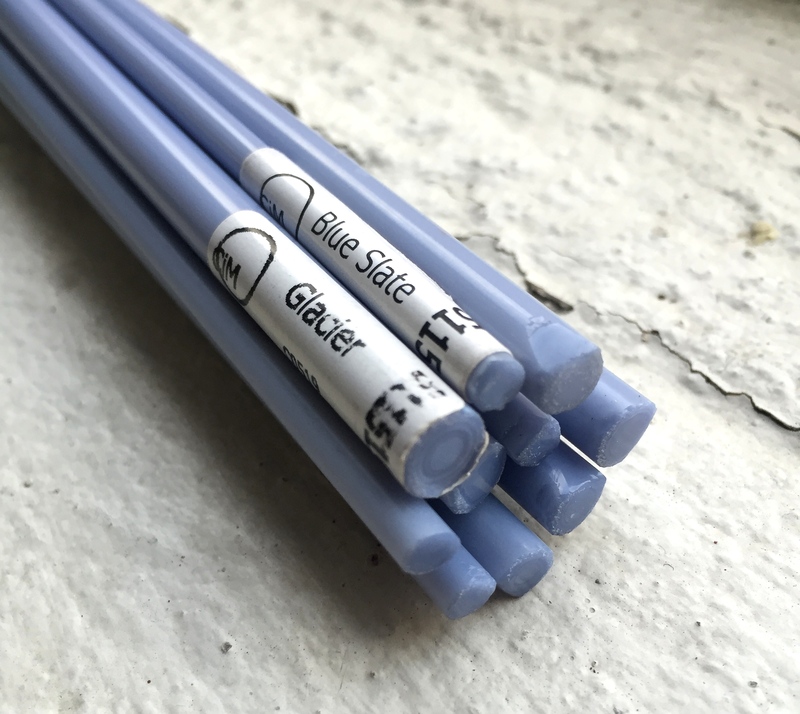 Glacier is a dependable blue that has a few little tricks waiting for you to discover. It fits so well with other soft muted colours and works equally well with fiery reds and yellows. It is a must have colour for your stash because it is so versatile. Canyon De Chelly will kiln strike, colours that were vivid coming out of the flame take on a pastel variation when annealed. Dark golden brown will be a pale brown ochre tone, caramel brown will become light caramel, purple will become dusty grey purple and green will turn a pale olive tone. Canyon De Chelly was in the original line up of colours launched by Creation is Messy in 2006 and is still in primary production today. My batch of Canyon De Chelly dates from 2006. 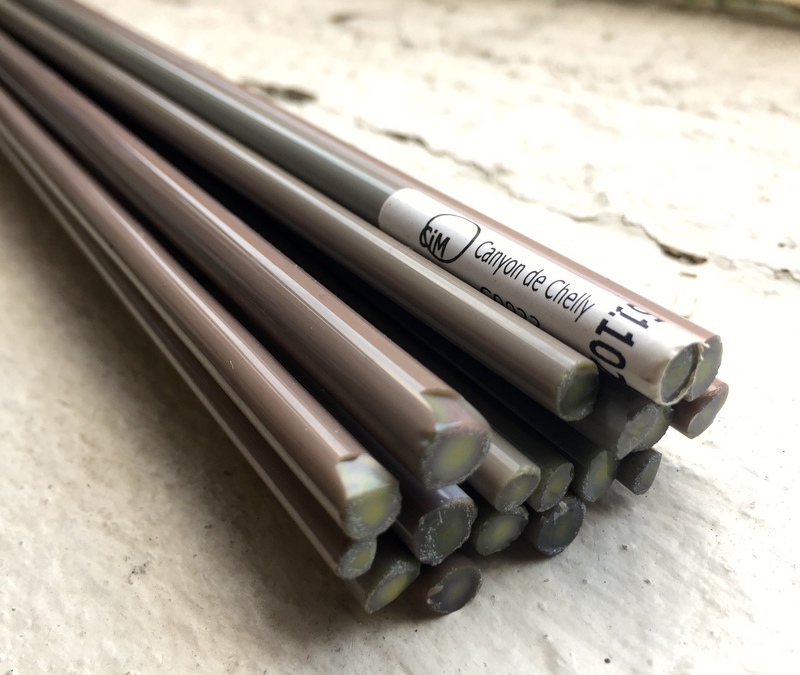 The rods for this glass are a smooth greyish-green to brownish green depending on the batch and the light (natural light seems to bring out more of the brown tones). Each batch varies a little, with some interesting concentric circles of different colours through the middle. The most interesting thing about this glass is the array of bruised pastel colours that will show up if you work the glass just right. Canyon De Chelly is named after the mystic canyons in the USA where the Navajo resided for thousands of years. Just like these great canyons, the glass is as changeable as the rocks that soar up hundreds of feet into the sky. You can trick a variety of colours out with careful heating and cooling and Canyon De Chelly will reward you with a range of pastel tones, rather than the sandy brown colour it’s most known for. The method for tricking out Canyon De Chelly’s colours reminds me of the technique used with Reichenbach Iris Orange Raku R-108 (“Raku” for short) to make it pop. In one sense I think of Canyon De Chelly as a striking glass (because it can kiln strike a little) in another sense, when I’m working this glass in the flame I treat it as if it is Raku’s little brother. 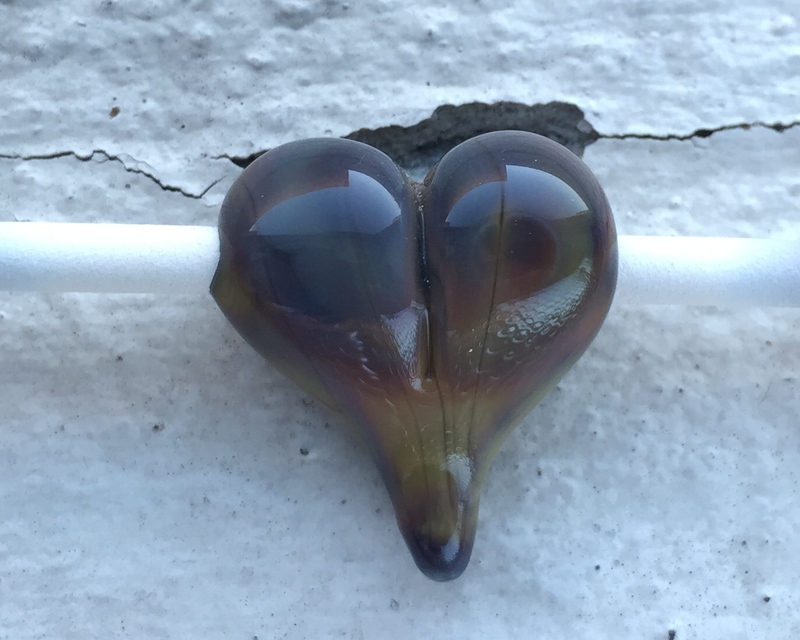 Side 2 of big heart bead, before being annealed in the kiln. The colours are not as intense as Raku but they are very pretty in their own right and a lot nicer than the brownish tones most people like this glass for. Here are my tips for pulling the soft pastel “bruise” colours out of Canyon De Chelly. 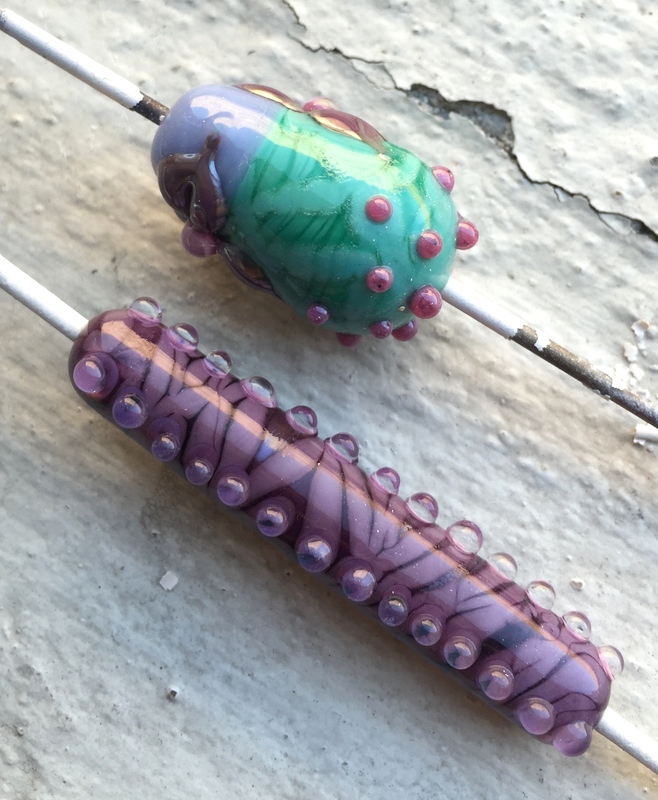 If you want to make these beads and you do not batch anneal, make them at the end of your torch session so that your beads are not soaking too long. Canyon De Chelly will strike all the way to it’s golden sand brown colour if the beads are sitting too long at a high holding temperature. You will lose the colours you’ve developed in the flame. 1. Get used to working slowly and out near the top of your flame if you want the bruised pastel colours. (This means you should be working about two inches above your normal working zone). CiM Canyon De Chelly photographed under a mixture of natural sunlight and “white fluorescent tubes”. Canyon De Chelly does shift colour slightly depending on the lighting arrangement. 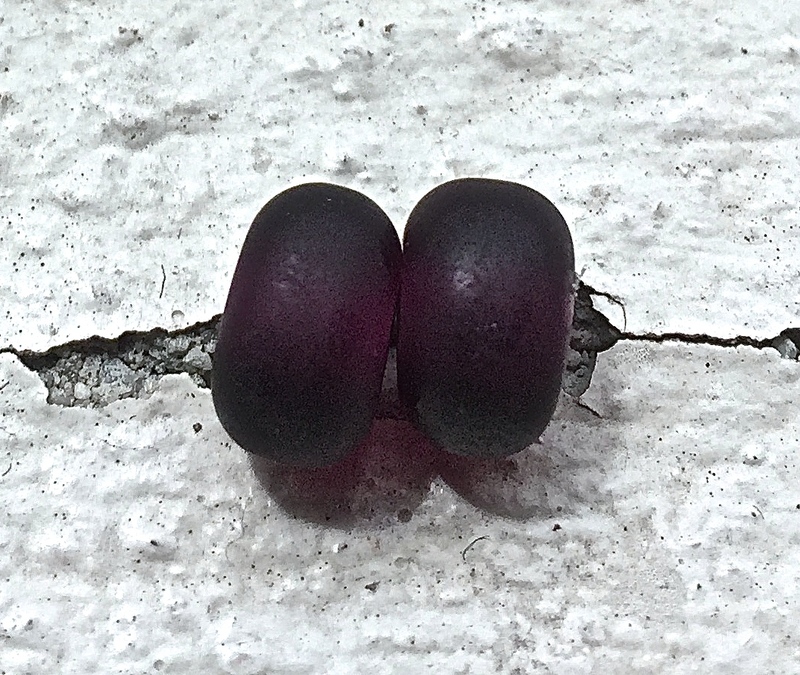 These beads have gone through an annealing cycle which has struck the colour a little further along. The variations are still visible but the colour is not as rich. This colour is particularly hard to photograph. 2. Any shaping and melting should take place in the top part of your flame. You’re working this glass cool and slow, if you bring it down to melt hot and fast you will strike it all the way to brown. 3. Once the bead is the size and shape that you want, bring it down into the middle part of the flame (where you normally work) and heat it all evenly. You want the glass to glow red, from a slow deep heating. Do not get it molten. 4. When the bead is glowing red all over (for a good sized round bead this will take about a minute), move the bead out of the flame completely, rotate the glass in cool air (This is also a good time to use any shaping tools). As it cools the bead should go white, you may think you’ve burned all the colour out, but you haven’t. 5. Slowly introduce your bead to the flame, green, then blue, then purple will develop (in that order) first. To get this colour range you don’t need much heat. To stop the reaction and to develop brighter purples, greens and blues, touch the glass to something cold. A brass marver is good. If you like those colours, flame anneal way out at the tip of your flame ,if you are batch annealing to stop the strike. 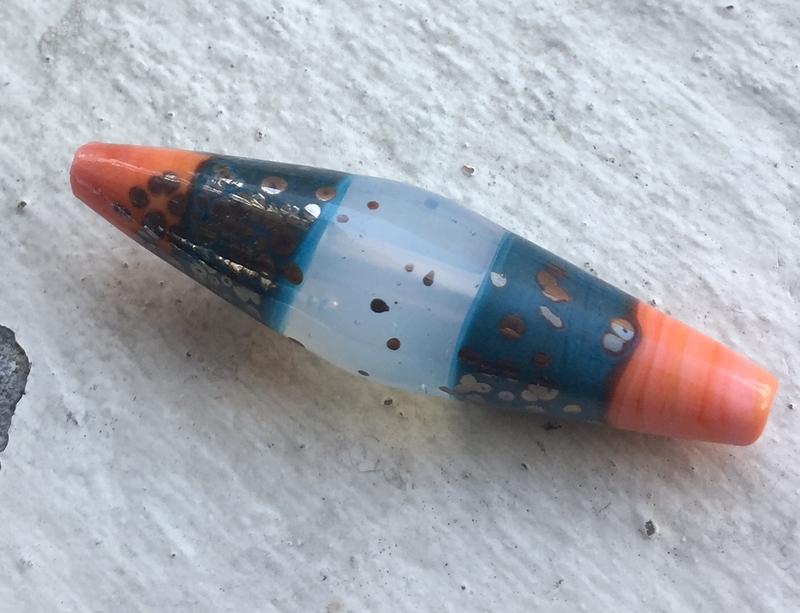 If you’re going straight to kiln, don’t let this bead sit too long before going into an annealing cycle. (The brighter you can get the colour in the flame the richer the colour will be after finishing in the kiln). 6. Keep heating if you want the darker grey purple tones and light caramel tones, if you go this far and touch your bead to brass or cold graphite you will pull back some of the paler blue, green and purple tones. Other interesting things to note with Canyon De Chelly is that you can layer dots of it on top of itself and you will see a variation (as if they were two different glasses). You may also get a thin black line around, for some reason this glass when merged with itself develops striations. It’s not exactly black, it’s looks almost like a transparent vein (see heart beads). Canyon De Chelly photographed in natural sunlight on a window ledge. (My camera has real trouble photographing this glass). Since the original photos were taken, I have etched the middle bead. I think it has definitely bought out the golden caramel colour a lot more. I like this glass etched, it etches very quickly. You will only need about 2 minutes to achieve a deep etch. As you can see, Canyon De Chelly turns very pastel once fired in the kiln. 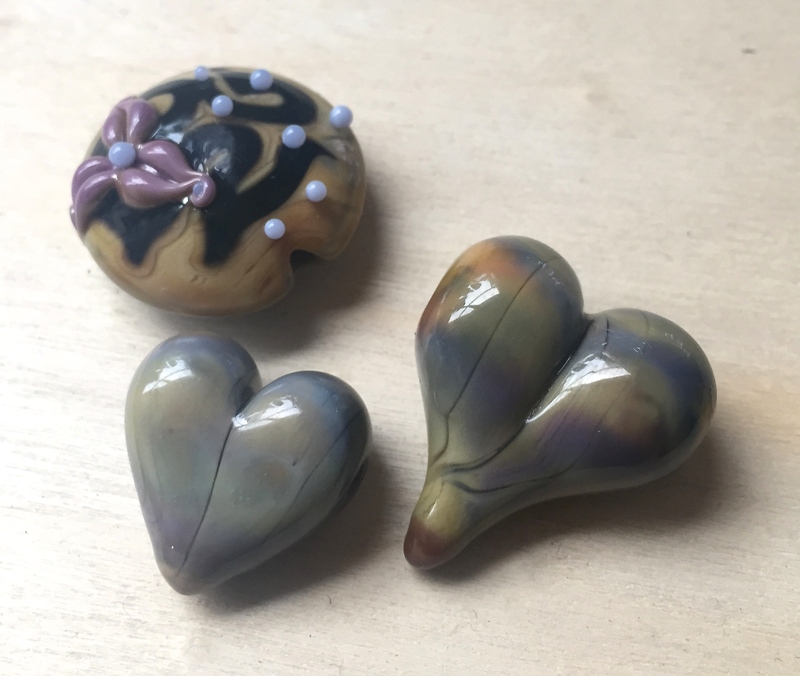 Also if you heat up a gather with intense heat and dot it onto your existing bead Canyon De Chelly will go a rich cocoa brown (see the very tip of the big heart bead for the colour reference). Hades and other dominant dark pastel colours like to spread out over the top (see lentil bead for reference). My kiln has a ramp up schedule of 5.5 degrees celsius a minute (330C an hour), holding at 45 minutes at 535 degrees celsius (995F) before ramping down at 3.5C a minute (210C an hour). I do run my kiln slightly hotter than normal firing temperatures because I mostly make very big beads. For Canyon De Chelly you may want to run your kiln to 505C (940F) to keep as much of the bright colour developed in the flame. Two sides of the same bead, half of this bead is made with Canyon De Chelly, the other half is Effetre Light Ivory. I encased the Canyon De Chelly side in Effetre Superclear and as you can see, there is a crack going through just that portion of the bead. The crack has splintered off and looks very much like incompatibility and not because it got too cold. Lastly, Canyon De Chelly is a soft glass (it doesn’t need long to etch) even after it has been correctly annealed it is prone to chipping. When cleaning bead holes out with a Dremel the glass will chip at the edges of the hole if not careful, so go slow if using a Dremel or electric tool to clean out the bead holes. I’ve only ever seen this chipping happen with Lauscha White Kryolith and Canyon De Chelly, it’s a sign that this glass is very soft. I was reminded recently that Canyon De Chelly is another one of those CiM glasses that does not like to be encased. Canyon De Chelly dots layered in trans glass for petals and such is fine, I haven’t noticed any cracks doing that. Creation is Messy Peacock Green beads with Reichenbach Opal Raspberry Opaque (96COE) R-65 and Effetre Dark Turquoise dots. R65 and Dark Turquoise react. CiM Peacock Green has changed in colour since it’s first introduction as part of the original Messy Glass range. My batch comes from 2006. 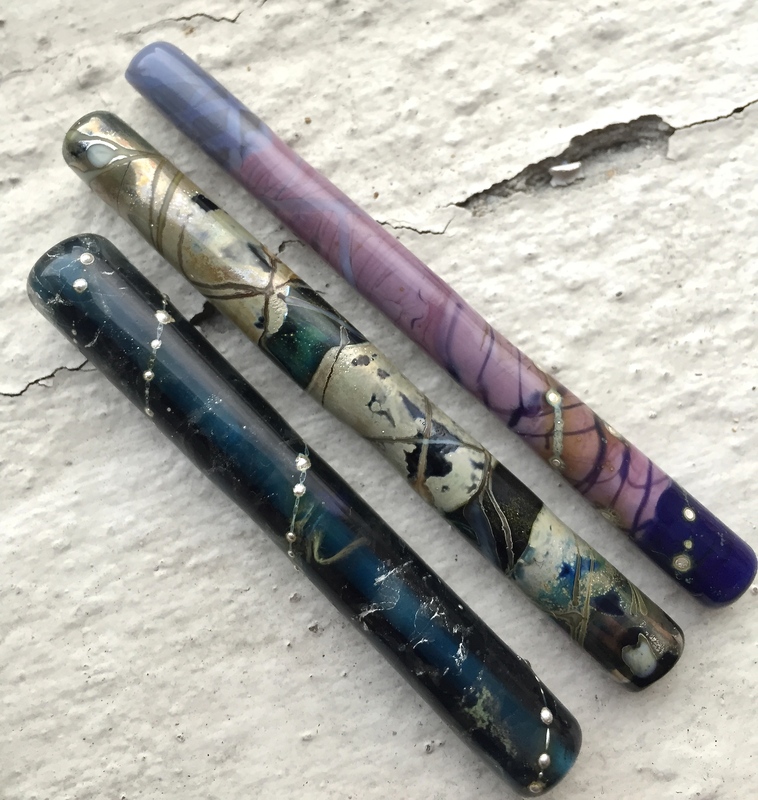 I don’t have any new batches of Peacock Green, but I have given some of my rods to friends who have shown me the stark difference via photographs. Older batches are very light emerald green, newer batches have more blue toning. 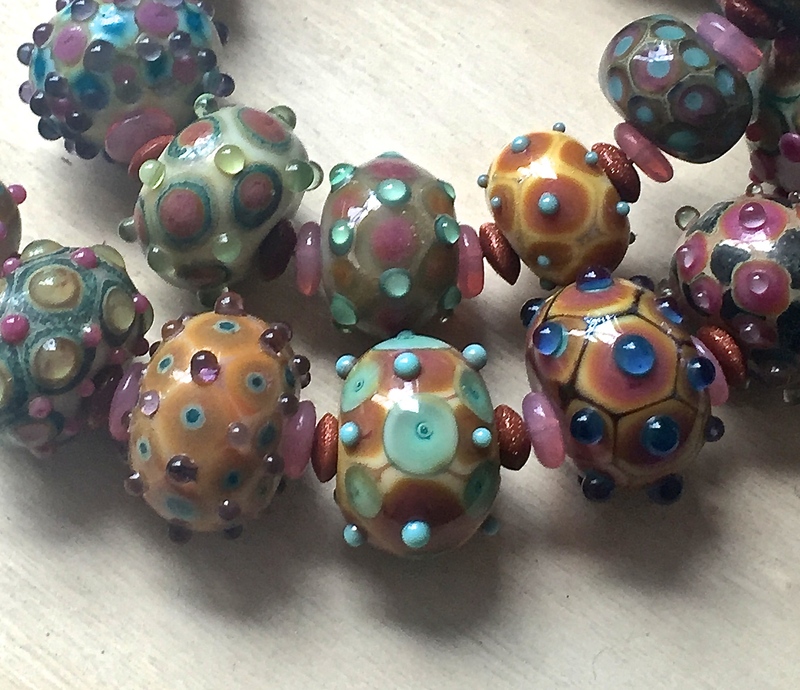 These photos all show beads made with old batches. However both batches perform the same in the flame. The only difference is the slight shift in hue. Its really hard to photograph the true colour of this glass. 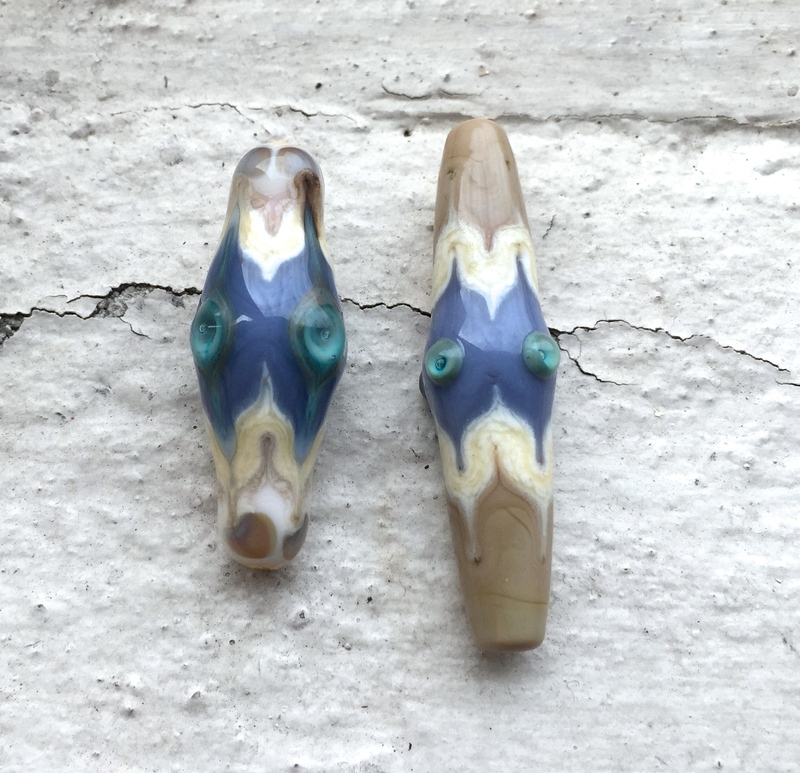 These beads are solid Peacock Green and shift their opacity depending on the light. Peacock Green will become more opaque with prolonged heating. It doesn’t become a “solid” colour. I heated these beads up for a long time to see if it did. Instead it will get darker in hue and opacify to look like jelly (it really reminds me of Apple Lime Jello). If you want it to look as it does in the rod, work it in the cool part of your flame and don’t let it get too hot. CiM Peacock Green used at the top of the bead with the blue flower. Showing that it doesn’t etch. Peacock Green is easy to devitrify if pulled into stringers and used as surface decoration. It also doesn’t like to be thickly encased. Encased stringers always scum up unless you’re really careful not to overheat. Deeply encased Peacock Green has developed cracks for me time and time again. So perhaps don’t risk encasing it in clear. However it is really great to encase with. Peacock Green picks up the silver in glass and reacts in an awesome way, it turns yellow! Dot decoration seems to glow when used in minute amounts when left raised. When melted in flat whatever it covers develops soft pastel tones. Effetre Turquoise under Peacock Green and melted flat is a pretty effect. This photo shows two beads (centre, one above the other) That have peacock green used as a small dot over Effetre Light Turquoise. When Peacock Green is used in such tiny amounts it retains it’s translucency, you can see in the bumpy dots that the colour seems to glow from within. Peacock Green doesn’t etch with Etchall liquid etch. All the beads photographed here have been etched. The top two photographs show the same beads that had been left in Etchall for 15 minutes, and there is no change to the glass at all. Probably a great trick if you want an etched bead but you don’t want the surface decoration etched. 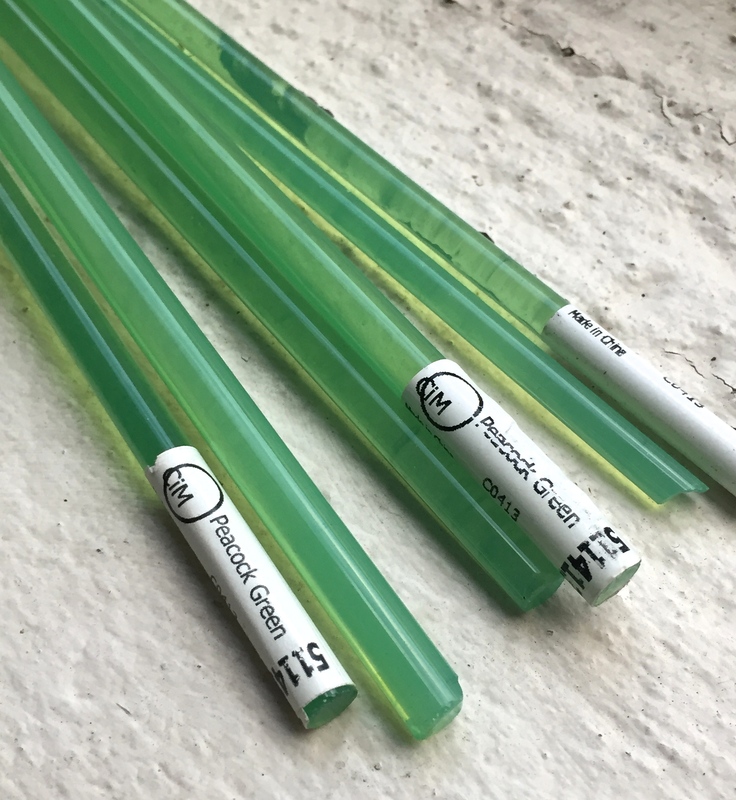 Peacock Green is a stiff glass and the rod needs warming in the top of your flame before use. Surface decoration won’t run or bleed on it, in fact, surface glass decoration doesn’t spread much at all, so it’s great for keeping crisp edges on designs. Its a unique colour to the 104 range of glasses and is one of my favourites because of it’s juicy green colour. Peacock Green in natural light showing some of it’s translucency. As for the beads in the very top two pictures. The reaction you can see in the Effetre Dark Turquoise is because it is layered over Reichenbach Opal Raspberry Opaque (96COE) R-65. There is a very slight reaction between the R-65 and the Peacock Green, producing a tiny dark line around the dots. Although there is no reaction between R-65 and Peacock Green. Peacock Green has a reputation as being a tricky glass that is flawed and incompatible with just about everything. Some of this is true, but it doesn’t completely deserve the bad reputation it gets. There are plenty of brands that have 104 glass colours that can’t be encased, Peacock Green is one. If you use this colour for a base bead it is a stable surface for dot decorations, with every brand of glass on the market. If you use it as surface decoration (dots and stringer – 10% rule) then incompatibility will not be an issue. I have blended Peacock Green (30%) with Effetre Pea Green (70%) and created a stable blended colour that is lovely to use as stringer decoration. Creation is Messy (CiM) Hades base, trailed with fine silver wire and leaf. Also trailed with Reichenbach Iris Violet (R-128). I got very excited when CiM Hades first came onto the market in 2006. Vetrofond Black (which is better than Effetre Black because it is more dense) was hard to come by in Australia. CiM Hades promised to have the density of Vetrofond Black, be in endless supply and easier to source. I wasn’t let down when I received it. I love this particular black if I am using it as a base bead, or to cap the ends of a long bead. It is a “soft” glass, which holds onto heat for a long time. I don’t Hades so much when pulled into stringer and used as decoration. When in stringer form the colour is still dense, but Hades spreads and won’t keep its crisp edges when layered over opaque glass and heated for prolonged periods. It is the nature of Hades to be a soft spreading black. At its best, it makes for a really excellent black to cap a design off, or as the base of a design. At its worst, it becomes a hard to handle mess. Depending on your overall design, the characteristics of Hades could be disastrous or really cool. One thing that a lot of artists have noticed is that Hades can be reduced. This is true, but trying to reduce Hades on its own takes a massive amount of reduction for quite a decent length of time to get it to reduce. I tested this out recently and it took a good three minutes in a heavy reduction flame to get Hades to reduce. When it does reduce it looks like a faintly metallic oil slick has spread across the surface of the bead. 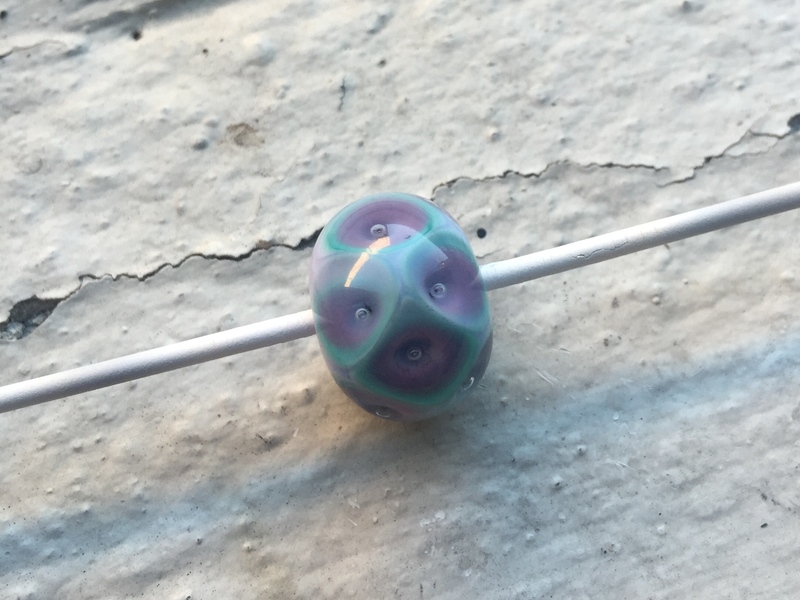 When I used Hades with Double Helix glass and reduced the bead, I found that the Hades sections fumed and reduced much more easily, with more pronounced oil slick effects. Hades fumes in the presence of some Turquoise glass and anything with silver in it. Again, depending on your overall bead design, this could be really annoying or freakin’ awesome. Personally I don’t mind this about Hades, but rest assured reduction on Hades doesn’t happen easily and is more likely to happen with a glass that has heavy silver content in it, which is understandable. 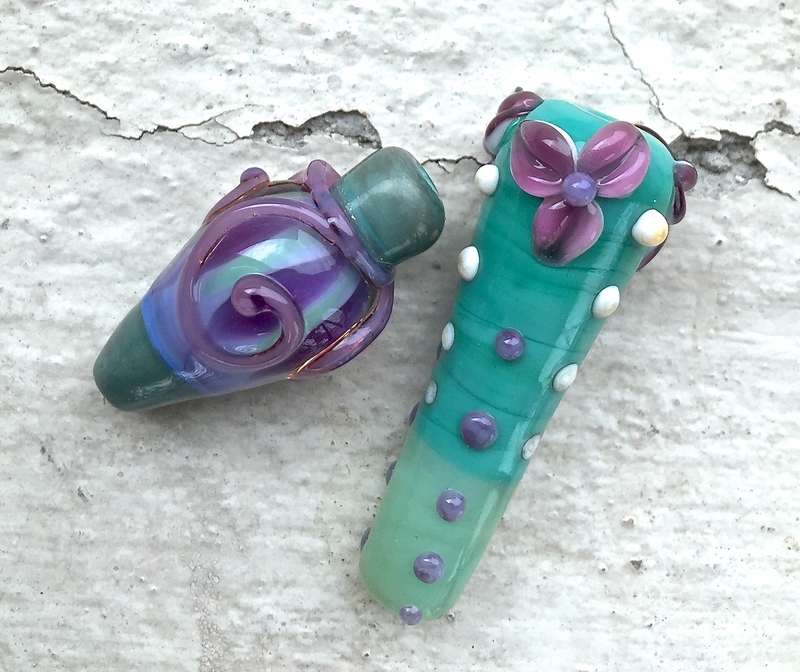 For these particular beads pictured below; I trailed Reichenbach Iris Violet over the top. When Iris Violet is lightly reduced it will get a silvery gold sheen. If Iris Violet is heavily reduced it will turn an oil-slick metallic dark purple. Although, when Iris Violet is placed directly over fine silver leaf with Hades as the base it leaves a dark line as if it had been heavily reduced. CiM Hades Base, covered in a thick layer of fine silver leaf and fine silver wire. (Thick leaf or foil will give a much more sandy effect on Hades). 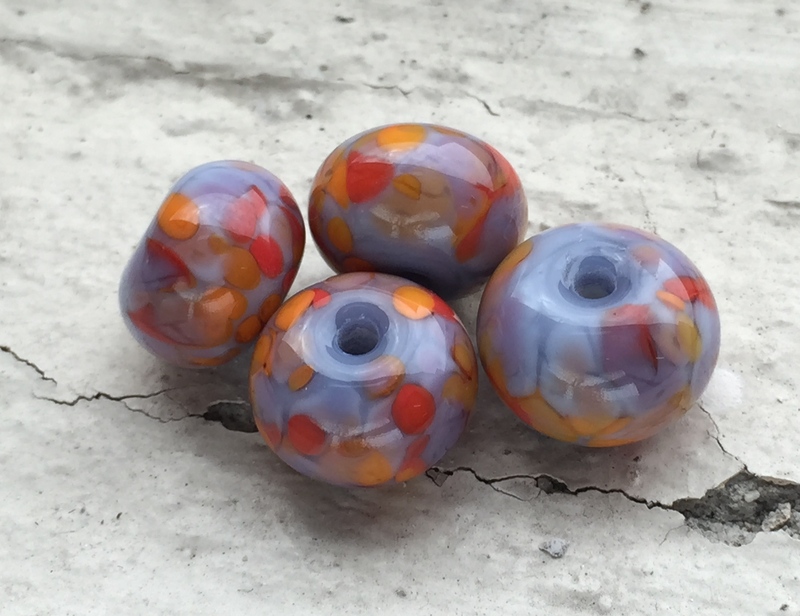 These beads were heavily reduced and dotted with Reichenbach 96 Opal Violet Opaque. Hades fumed and went copper brownish (look at the spacers) unexpectedly when I was reducing the bead after I had placed the R-128 trails on the round bead at the top and in some of the spacers. So if you like the blue green effect on these beads. Make your base in CiM Hades then use leaf (not foil) and burnish it in really well, reduce the bead lightly. If you are going to trail R-128 over the top, reduce the the bead once. Don’t reduce the leaf then reduce the R-128 you will transition the leaf into the sandy colour. (Although if you really like the sandy colour, a heavy reduction will get it to look very reflective, like molten mirrors on the surface of your bead). CiM Hades is a soft, melt like butter, dense black glass. It etches very easily and is really lovely etched. It holds onto heat, so be careful if you encase it, the whole bead can move if you don’t let it cool properly. 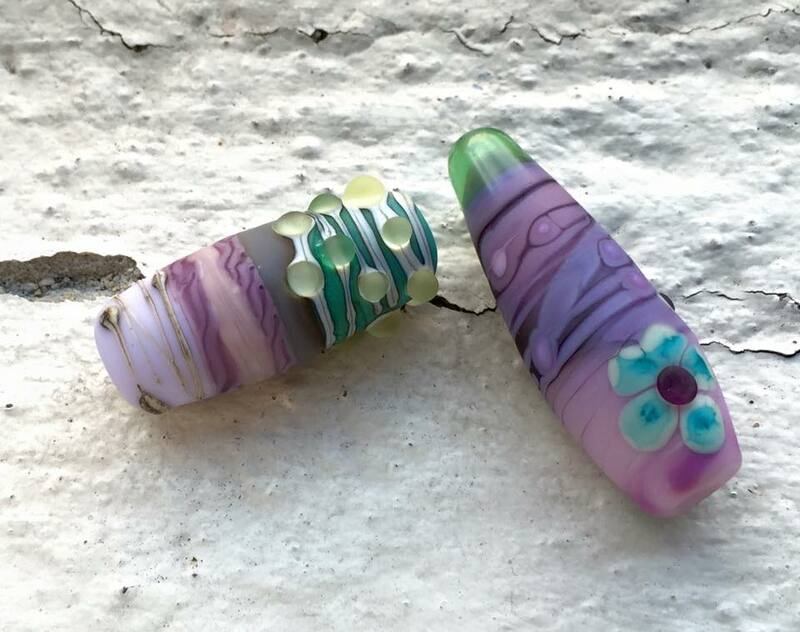 This is a must have glass if you’re teaching a beginner’s bead making class as Hades is so forgiving in the flame and so easy to heat and round out. Hades is heavily pigmented and can be used to produce organic effects when layered over other reactive glasses. It webs like intense black over Effetre Ivory, but not with the same intensity. Hades will create a cloudy web effect if superheated and allowed to move. When pulled into thick stringers Hades doesn’t go transparent, but it does look blue-ish if pulled into fine stringers. Hades likes to spread and web out over other opaque glass when heated hot and fast and particularly likes to crawl across transparent glass if overheated. Hades is great for small spacers and working fast because it melts so quickly. I would keep it in the back of your mind that Hades for murrine might not be the greatest choice because of it’s tendency to creep over other colours when super heated. I have used Hades extensively in my testing of the Double Helix Garage Box colours, I’ve purposely chosen Hades to test because it is such a fundamental CiM colour and its reaction to silver means that its likely to produce some interesting results with Double Helix glass. You can check the Double Helix section of the blog for more details on Hades and Silver Glass. If you want really sharp black stringer control on opaque colours use Effetre Intense black, or if you can get your hands on it Reichenbach Opaque Black. 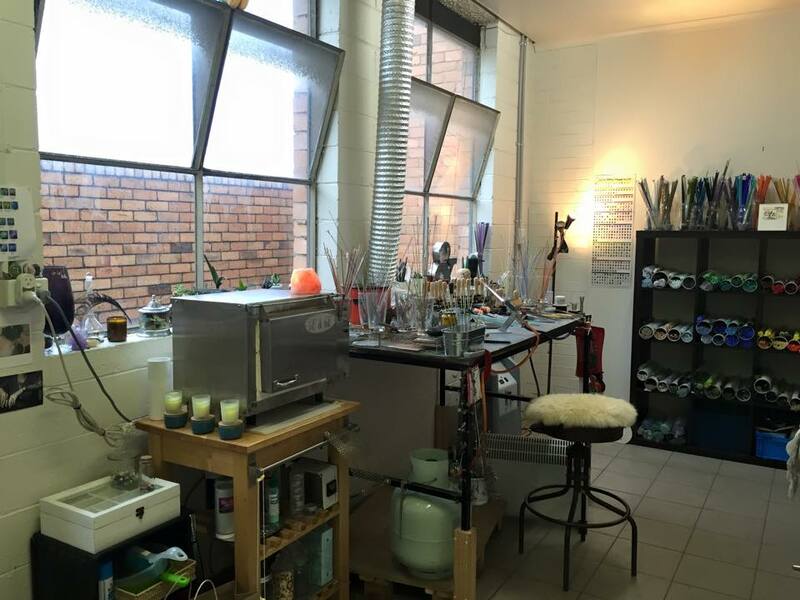 The Alchemistress Studio, May 2015. Melbourne, Australia. 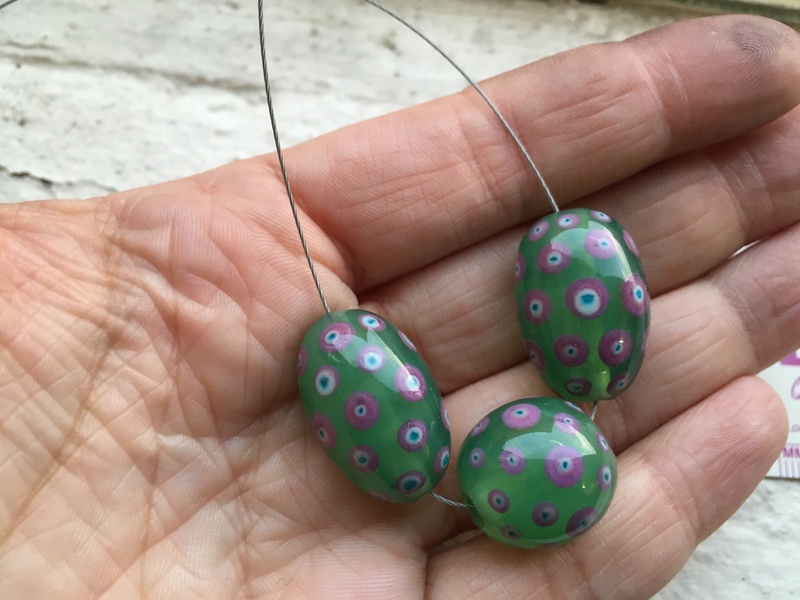 My blog contains testing notes, photographs of glass, beads, mini tutorials and links to my quick Instagram videos showing the properties of COE104 soda-lime glass. I test glass that I work with in my studio, some of the glass I test are colours that have been around for a long while or old batches. The aim of this blog is for me to keep track of what testing I have done for myself. 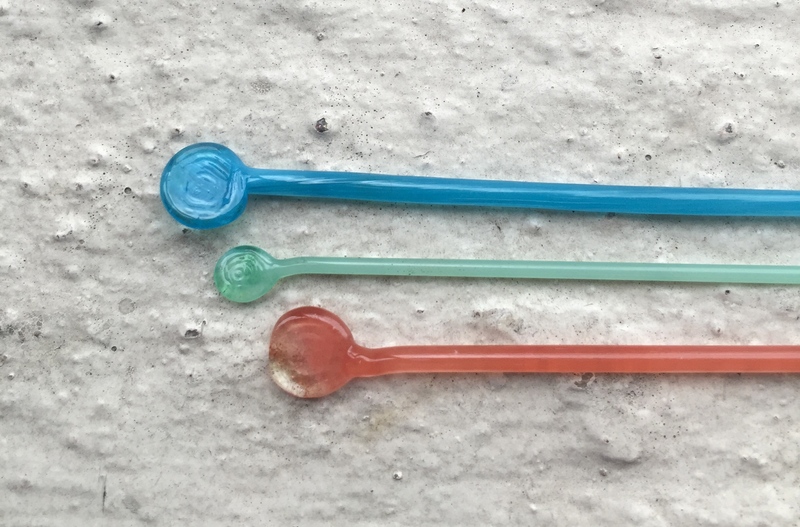 It is not intended to be a complete resource for all types of soda lime glass or to test the latest colours. I’m a busy person so the blog gets written in the limited free time that I have. I am by no means a glass expert, I am sharing my personal notes and you can use my advice at your discretion. There will be colour recipes and tutorials on how to get certain effects buried within the glass testing notes, but be mindful of my set up. You may not get the same results. 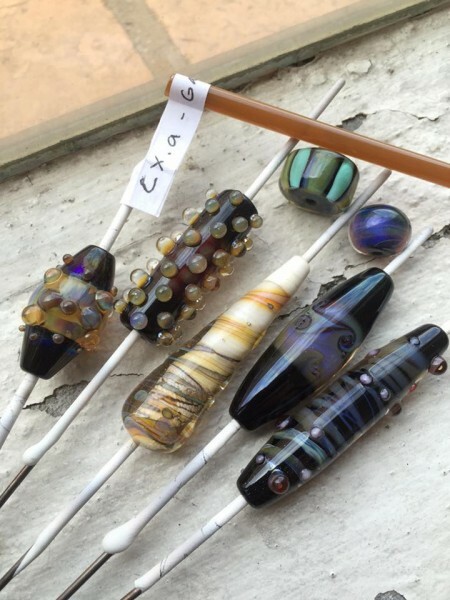 I enjoy testing the properties of glass as much as I like creating beads and I love to share information in the spirit of supporting the glass bead making community, both in my home country of Australia and around the world. Huge 2in lentil beads made with a combination of Double Helix, CiM and Effetre glass. Most of my notes are handwritten into little books and on scraps of paper, so I don’t have accompanying photos. After a while I found this method of keeping data really hard to follow and that is why I started this blog. Once I post glass testing notes, they are not static. As I discover new things about the glass, I will go back and make amendments or add photographs with new information. This means that my blog is ever evolving and it should, because glass batches do differ. I started writing this blog in 2015 and there isn’t a huge amount of information up because of how much time I devote to my full time teaching job. It will slowly be updated, as I have the time to take photos of test beads, make new beads and upload my notations. When I have used tools or presses in a design on a bead, I will try and explain or link to the exact tool. Some of my tools are “found objects” and some are modified for my purposes. As links go out of date, I will try and update them. I have included a section of my blog devoted to setting up a studio either as the first time or as an upgrade. The information in this section is purely based on my experience of setting up two small studios for personal use. The information given in this blog is advice only, I’m not an expert and I’ve never set up a teaching studio with multiple torches. I personally like to work within my means, having said that, in the last few years I’ve been able to afford better equipment and a lot more glass. 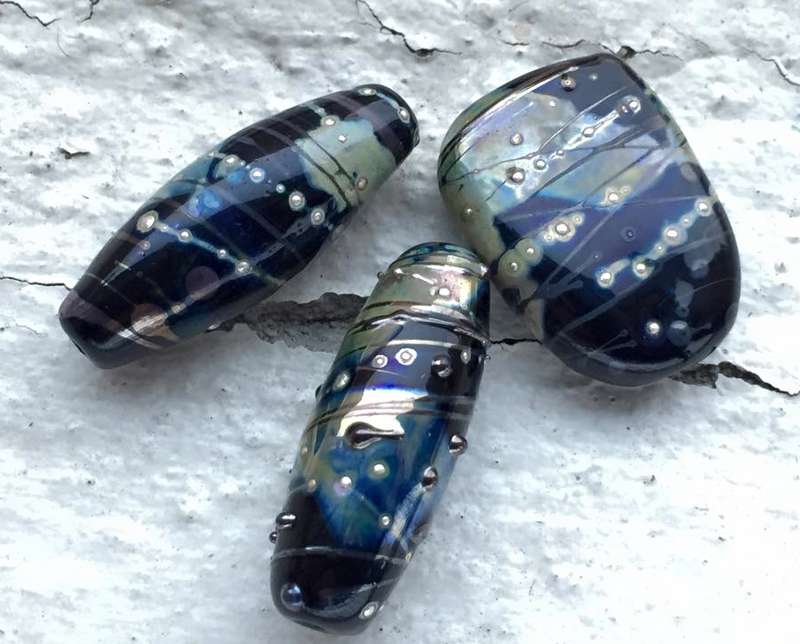 These beads are a mixture of fine silver leaf and wire, Effetre and CiM glass. To get an understanding of size, the middle bead is the same length and thickness as a cigarette. I used to work on a Nortel Minor Bench Burner that is connected to a 10Lpm Commercial Oxygen Concentrator and a regular BBQ gas bottle from my studio in Richmond, Victoria (Australia). I have recently purchased a Nortel Mega Minor Burner and from December 2016 onward, all of my testing will be done using this torch. I work only with Soda Lime Glass in COE104, fine silver and sometimes I will use 96COE frit or rod, this means that most of my testing is done on 104 glass. For ten years I batch annealed my beads, however, as of December 2016 all of my beads will be flame to kiln annealed in a Paragon kiln. My testing is primarily done on 104 COE glass, my favourite brands are Lauscha, Creation is Messy, Vetrofond, Effetre, and Double Helix glass. I do have notes on Reichenbach 104 and 96 glass as well. I will sometimes mention commercial frit brands in my testing if I have used them on a bead in a photograph. Most of my Creation is Messy glass comes from the first melts the company ever did, the batches are dated to late 2006 and early 2007. I sell this glass in my etsy shop along with my beads and jewellery. I started making beads in 2006 after getting up the courage to jump in and give it a go, like most people I had a basic introductory lesson and am primarily self taught. I feel like I’ll never know everything about soda-lime glass. Since I have an inquisitive mind, I want to know everything that I can possibly know, so I will also never be satisfied. The extent I go to test a rod of colour includes effects and techniques. Encased in different brands of clear and against different base colours such as light and dark opaques and transparents. I live in Melbourne, Australia; which is a really nice place to live, but its so far away from the action in the glass world. Being so far away means that I don’t have access to all the latest colours and innovations. Specifically, living in Australia means that I can’t test the latest colours immediately, in fact I sometimes can’t even get my hands on the new colours at all, they’re sold out well before I can afford them. This is the global economy and that’s life. In my blog posts, I try to compare older batches to new batches of the same colour glass when I can. Thank you for reading my blog, it means a lot to me that in the short time I’ve had it online that artists have found it very useful and have encouraged me to keep going. This blog is for me, but its also for you. 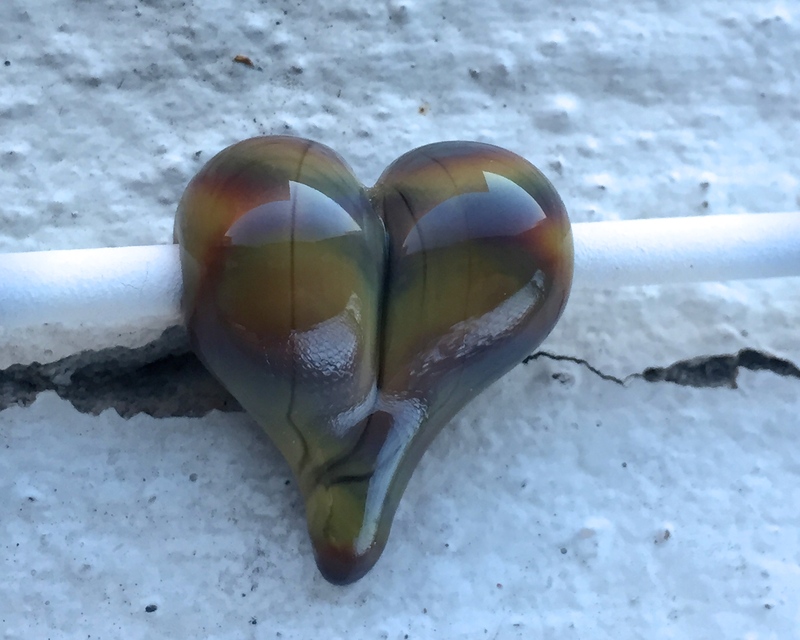 I hope I am able to inspire you to create something new or get you to think differently about glass that you already have in your stash.